An electrocardiogram (ECG or EKG) is known as a test that records electrical activity from the heart. This electrical stimulus test holds responsibility for ‘reporting’ the heart’s coordinated beating. Any abnormalities or problems with the test recording indicate abnormal heart rhythms. Heart attacks are likely to also change the electrical impulses derived from the test. Therefore, the electrocardiogram sometimes helps diagnose these heart attacks, in addition to the aforementioned abnormal heart rhythms, and aids doctors in deciding which treatments to use for various heart-related problems. To perform the test, no major preparation is required. The EKG technician performs the test by placing sensors or electrodes with conductive gel applied onto a patient’s chest, arms and legs. The leads then collect and measure electrical activity from the heart, from the sensor’s different angles, as the heart beats. Patients have to lie still during the examination, which allows the technician or examiner to accurately measure the electrical activity. 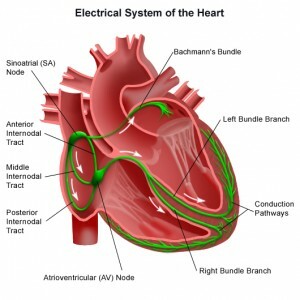 During this process, the electrical activity gets recorded, later examined by a cardiologist. Although patients are advised to report any type of chest pains during the exam, most patients don’t have to restrict physical activity following the completion of the exam. Patients are advised to get an electrocardiogram performed if they’re experiencing chest pains or other cardiovascular problems. Due to the nature of this test, there are specific types of patients that may better benefit using the tool to detect their cardiovascular issues. Patients who may have experienced abnormalities in their heart rate and/or rhythm. Abnormalities in heart rate may indicate the onset of issues potentially affecting the heart’s regular functions. Patients who have experienced a heart attack and/or stroke in the past. Electrocardiograms help check the heart’s condition following the onset of the aforementioned conditions. This further monitors the damage impacting the heart. People who may be at risk of heart-related conditions. Diabetes, high blood pressure and heart disease can affect the heart in detrimental ways. This helps doctors quickly diagnose any underlying problems as they’re detected. People who are over the age of 40. People in this age bracket may be at risk of age-related heart conditions and other cardiovascular abnormalities. Some doctors may advise patients around that age to have a regular electrocardiogram as a part of their annual checkup. People who suffer from chronic conditions or diseases. Sometimes, debilitating immune disorders like HIV and AIDS can affect how the heart functions. Electrocardiograms help detect issues with the heart, allowing doctors to diagnose treatment options to prevent the further aggravation of those diseases. Electrocardiograms are perhaps the most common cardiac test. It’s a powerful tool used to screen a variety of cardiovascular conditions and abnormalities. They can detect heart rate and rhythm, abnormalities in its electrical impulses, heart complications from heart attacks and the thickening of the heart’s muscles, in addition to the onset of coronary artery disease. Since the device used to perform the test is readily available at various medical facilities, it’s simple to perform and relatively inexpensive. Patients who aren’t experiencing any issues, however, aren’t advised to get an electrocardiogram unless advised.